Lead Sources let you track where your leads learn about your school. Identifying productive sources can help you decide where to focus your recruiting efforts. You can associate sources with inquiry and application forms and get solid information on how exactly your leads are learning about and connecting with you. First, you create source types—these are big-picture sources which you use to categorize individual lead sources. For example, you might have an "Online" source type under which you place sources like "Facebook Campaign" and "Website Banner Ad". To get started, head to Admissions > Settings > Lead Sources. 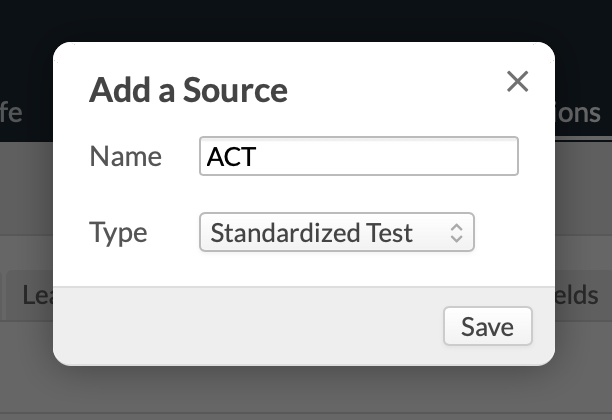 In the right column, click add next to Source Types. 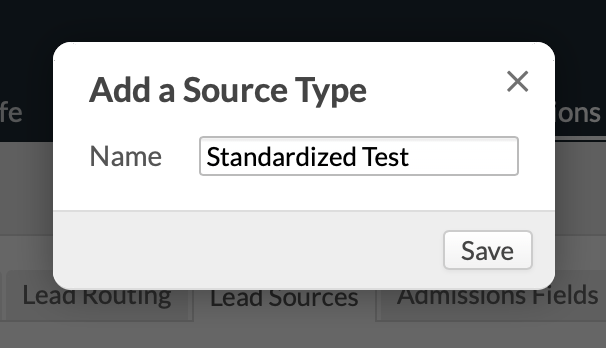 After adding source types, you can start adding individual lead sources. You can do this as often as you need to. At the top of the left column, click Add source. Give the source a Name. In the course of time, you'll come back here to add new types and sources and retire old ones. To retire either a type or a source, click its name; in the dialog, check next to Retire.